We specialise in the maintenance, repair, replacement and certification of fire doors and frames on the Gold Coast & Tweed. We provide quotations to Body Corporates, strata management companies, passive fire protection companies and property managers for all fire door maintenance and replacement here on the Gold Coast and Tweed Heads areas. We service all residential, commercial and industrial buildings. 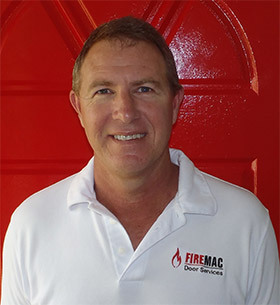 Our expert, David McKenzie, has over 25 years experience in the fire doors industry and is a certified Fire Door Inspector. Advance Certificate in Building Supervision. Accreditation with the Fire Protection Industry Board of Queensland inc.
We’d be delighted to assist you with your fire door needs and our super friendly team are here to help.